Now offering multiple fertilizer options. 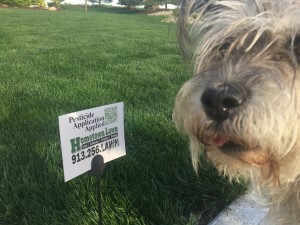 Hometown Lawn, is a full service lawn, landscape, irrigation and drainage solutions provider for commercial and residential turf licensed by the State of Kansas Department of Agriculture to legally apply pesticides. 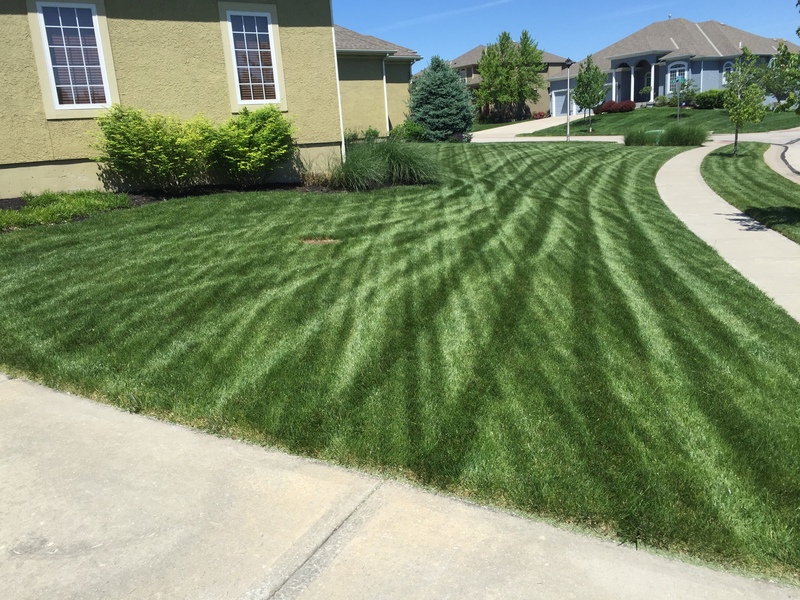 Hometown Lawn provides lawn fertilizer applications in the cities of Olathe, Lenexa, Overland Park, Leawood, Shawnee, Mission, Merriam, Gardner, Spring Hill, Fairway, Prairie Village and more in Johnson County, Kansas. Be sure that anyone you are comparing estimates to have a license and insurance. It is required by law. Hometown Lawn offers a full-year seasonal pesticide program that includes grub control. Discounts are offered when the entire annual program is purchased. Email us your address for a Free Custom Lawn Quote. The Hometown Lawn Custom Annual Lawn Fertilizer Program offers 3 options. Professional, slow-release fertilizer plus crabgrass pre-emergent. A barrier is created at soil level, controlling weeds before they appear. **For fall reseeded or dormant seeded lawns, please be sure to inform us, this product is not recommended to be applied within 12 weeks of seeding. For best results, apply this product within a few days after mowing and delay mowing again for a few days after the application. When treated lawn or ornamental turf areas are watered or receive significant rainfall within a few days after application of this product, improved weed control may result. This application occurs concurrent with Step 3. Step 2, like Step 1, is a professional, slow-release fertilizer plus crabgrass pre-emergent granular that delivers more nitrogen while continuing crabgrass protection throughout the summer. A vapor barrier is created at soil level, controlling weeds before they appear. We apply Steps 2 & 3 on dry, low-wind days when temperatures are above 65°. Do not mow for 48 hours after this application or water within 2 hours. This step is a selective liquid herbicide for control of broadleaf weeds (Ref: K-State) such as Dandelions, Clover, Henbit, Creeping Charlie and others. We apply Steps 2 & 3 on dry, low-wind days when temperatures are above 65°. Do not mow for 48 hours after this application or water within 2 hours. Professional, grub control helps control grubs at the appropriate time in their life-cycle. The actual application period is dependent upon real weather conditions occurring. For optimum performance this application must be done under certain circumstances that we will determine unique to every year. Pr ofessional, slow-release nitrogen fertilizer helps turf recover from summer stress. This application includes something from each of the “Big-Three”. N-P-K, Nitrogen, Phosphorus and Potassium. Nitrogen supplements growth and color. Phosphorus stimulates root growth and Potassium enhances disease resistance. This is a vital step to overall turf health. For lawns that are doing a Fall verticut and overseed, this step can be repeated approximately 21-28 days after seeding for optimum results. Winter root builder assists roots to move laterally and develop rhizomes, for fast thick spring growth. This product encourages drought and traffic tolerance. A Lime application can balance an acidic soil. Indicators can be if you are seeing lots of weeds and/or clover. Readies soil for planting and can keep the green. This step will apply with Step 4 – Grub Control. Include an added preventative for pesky bugs and insect. Ants, chiggers, mites, fleas are some of what’s treated with this optional application. *Steps 3 & 4 are performed on the same day. Steps 4 & 8 are performed on the same day when purchased. Steps 1, 2, 4, 5, 6 & 7 are a granular application. Step 3 & 8 are liquid. As a professional courtesy of being a Hometown Lawn customer, a liquid selective herbicide spot-spray at the time of each granular application is included at the time of service. (Subject to weather conditions). All paved surfaces adjacent to application areas are blown off after each application. Separate service calls will be reviewed and billed on an individual basis. Actual products may vary upon application from what is listed in this page, due availability or applicators determination.